Coach Mullins is the adult between numbers 35 and 25, and Lee is number 45. This is an excerpt from a chapter in Fire and Forget Soldier. The theme of Lee’s life is resilience. He was put into a foster care system before he was two-years-old because his mother suffered from debilitating depression, and his father didn’t have the money to pay for childcare. He was reunited with his family at age six, and then at the age of nine, Lee lost his father to a heart attack. And, his father passed literally just hours after moving the family from Baltimore to Tullahoma, TN. Lee’s mother wasn’t emotionally equipped to handle the loss, and the kids (Lee and his two sisters) were left to raise themselves. Over the next year, Lee attended four different schools. He was small for his age and had freckles and red hair. In essence, he was the perfect target for bullies. He learned to be a brawler in order to survive. His future was looking bleak, but then he met Coach Frank Mullins. Lee was becoming a throwaway kid. He had no parental guidance, no interest in playing by the rules, no one to even tell him what the rules were. He was slipping through the cracks, and if not for his love of football, he may have ended up on a much different path altogether. 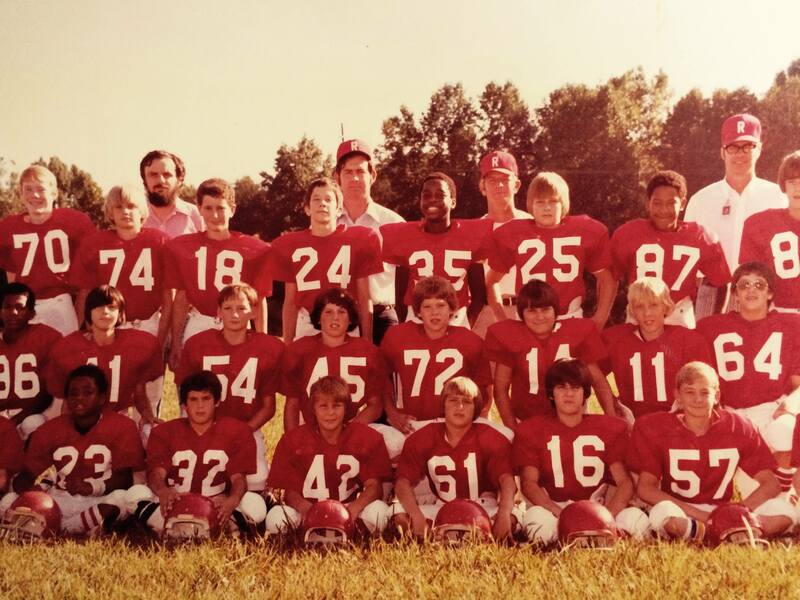 When Lee was ten, he walked from his house to D.W. Wilson community center where they were holding registration for tryouts for Pop Warner football. He was the only kid without a parent, and he was the smallest gridiron hopeful by far, so small no team wanted to take a chance on adding him to their roster. Lee was despondent. He wanted to be like his dad, a football star, but it didn’t seem like he’d get the chance to prove himself. Just as the too-small kid from Baltimore was about to give up, he was approached by a man who asked, “What team are you with, big ‘un?” Lee explained that no one picked him because he was too small. The man leaned down and said, “Tell you what. You head across the street there, fill your pockets with rocks, and come back here and weigh in. Then you’ll be big enough to be a Rebel.” The man, Coach Frank Mullins, would go onto become a legend in Tullahoma. The Pop Warner league would eventually become the Frank Mullins league. He would spend decades in youth football teaching young boys the game of football and giving them the gift of brotherhood outside of family. He would show them that win or lose the true value of a team was a belief in one another and the goal wasn’t to win a game, but to give your best for your teammates. The gesture wouldn’t have an immediate effect on Lee, but what Coach Mullins did for the little guy no one wanted to take a chance on that day was show him the value of hope while at the same time planting a seed in the young boy’s mind that there is always a way to achieve your goals. It may not be the same way everyone else does it, but if you think outside the box, you can make your destination, no matter the obstacles in front of you. Putting those rocks in his pockets to be big enough to be a Rebel was no different than when, years later after receiving his fifth rejection for a transfer to a Ranger battalion, he would get a fresh haircut, put on a well-starched uniform and polished boots, and walk into the 2nd Ranger Battalion barracks and tell the company commander that he wanted to apply for a job as if he were applying for a job in the civilian world. Ultimately, the tactic didn’t work, but it left an impression with everyone on the base, and it wouldn’t be his last attempt to become a Ranger. The lesson that Coach Mullins had taught him was that there is always a way. I asked other folks from Tullahoma to share Coach Mullins stories, and I’ve gotten a couple of great responses. Interestingly, Lee Brown (A classmate and good friend to both Lee Deckelman and me) has a similar Coach Mullins story, the difference being that Coach M suggested Lee B wear a large, heavy chain under his shirt when he weighed in. I moved to Tullahoma in high school, so I never had the opportunity to play for Coach Mullins, but he was a presence at all our high school games, and my friends always greeted him coming on and off the field, treating him with great reverence. The point I take away from this story is that the smallest thing you do for someone can make the biggest difference. May we all have someone who will take the time to tell us to put rocks in our pocket. This entry was posted in My Books and tagged fire and forget, nonfiction books, private security firms, soldier's story. Bookmark the permalink.